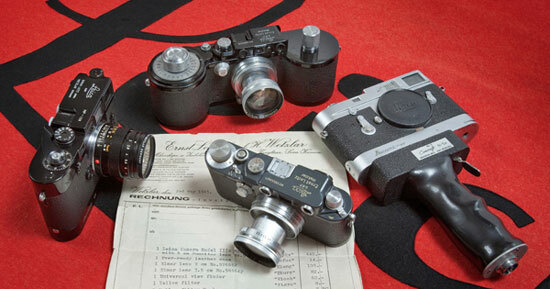 This auction will be especially attractive to Leica collectors because we will offer a wonderful collection including a black Leica MP, a chrome Leica MP, two Leica 250 Reporter cameras, two prototypes of the original Leica M motor drives, a Minox Riga, a gorgeous war-time grey Leica IIIc(K) with the original E. Leitz invoice, a Leica SP in the box, a 50mm Nikkor 1.1, a Thambar, Mountain-Elmar, a black enamel 50mm Summicron f2,a handsome Contarex Electronic outfit, and many more exciting rarities. The completely illustrated auction catalogue will be available April 2, 2012. This entry was posted in Other Leica Stuff and tagged Tamarkin Photographica Auction. Bookmark the permalink. Trackbacks are closed, but you can post a comment.